THE ORIGINAL CONCEPTS of the late Dr. ALBERT ABRAMS, M.A., M.D. Dr. Albert Abrams, M.A., M.D., LL.D. Dr. Eric Perkins is probably the last surviving friend of Dr. Albert Abrams in this country. His tireless efforts to gain recognition for his friend’s remarkable achievements have been an inspiration to us all. Dr. Abrams, born in 1863, was the first person to introduce a calibrated instrument capable of assisting in the detection of the disease radiations of living tissues. This raised Radiesthesia to the level of the science known today as Radionics. In this widest form Radionics can be said to be the meeting ground of all the sciences, and those who wish to study this exciting subject would do well to commence by giving serious attention to Dr. Abrams’ work. His method of differentiating between the numerous radiation patterns emitted by the human body has provided the basis for all the subsequent work in this field. Geo. W. de la Warr. Between the years 1914 and 1920, my reverend friend and teacher, the late Dr. Albert Abrams of San Francisco made history by drawing the attention of the Medical Profession to certain medico physical discoveries of far-reaching importance he had made, by research involving the direct application of the then recently established doctrine known as the Electron Theory of Matter, to the ultimate particles, the atoms and molecules, of human tissues. Abrams’ discoveries, being demonstrable, proved completely convincing to large number of medical men who had not only witnessed them “in action”, but were, in many cases, themselves making daily use of them for the benefit of their own patients. These physicians clearly understood the theories underlying the discoveries in question, since being members of Dr. Abrams’ Post Graduate classes, they were well acquainted with the epoch making but still very recent revelations in regard to the nature of Matter, then issuing from the laboratories of the Atomic Physicists all over the world. Had the eminent medical men, the supposed leaders of the Medical Profession, themselves had the privilege of studying under Dr. Abrams, they too would have understood the latter’s discoveries, and applauded them, but in their ignorance of the new (atomic) physics (admittedly a closed book to most other people in those distant days) they refused to believe or even politely to listen to, the facts that Abrams’ students, earnest, responsible medical men thought they were, sought in vain to put before them. But if treatment meted out to Abrams’ supporters was offensive, it was nothing in comparison with the spoken and written references made by these men against Abrams himself, and reproduced weekly in the Medical Periodicals of those days. Regardless of the easily ascertainable truth in regard to Abrams’ high qualifications and professional status, he was variously described as a charlatan, a quack, and a shameless exploiter of the sick and suffering for the sake of financial gain: As a rat in a hole, gnawing at the pockets of his unwary dupes: As the inventor of a “Box”, which he (Abrams) claimed, would “first find out what was the matter, and then put the patient right again”. Unfortunately, the Medical Profession, knowing nothing of the truth, believed this nonsense: it has not yet been possible to undo the incalculable damage done. I want to begin this talk by telling you the truth about Abrams the man. After that, I shall beg you to be patient if — for an appreciable time, I say no more about Abrams or his discoveries, for I feel it is essential in the first place — to describe, step by step, the epoch-making discoveries made by the world’s greatest scientist between 1898 and 1914. They were by far the greatest scientific discoveries of all time, so great that they must inevitably transform all our lives within a comparatively few years — or else — end them! These discoveries have — of course — to do with the exact nature of atoms. Abrams did not make these discoveries, but he was the first physician to realize that sooner or later they would inevitably transform the whole theory and practice of Medicine, and thanks to the extraordinary successful and original experimental work he carried out in his own laboratory, he proved that the dawn of the new medical era he envisaged, was already breaking. And now, let me tell you the unvarnished truth in regard to Abrams — my friend. Born in 1863, Abrams was the son of a successful San Francisco merchant from whom, at an early age, he inherits a vast fortune. Despite his wealth, he decided to devote his life and his fortune to the furtherance of medical knowledge. The best medical education that was available in America in those days, did not satisfy him, and so, after mastering the German Language — though already holder of an American medical diploma, he enrolled himself as an undergraduate at the University of Heidelberg, from which in due course he graduated with the degrees of M.A. and M.D. — the latter with First Class Honours, and the gold medal of his University. Loaded with Academic honours, this alleged quack was now as highly qualified as any physician in Europe. It is worth noting that while at Heidelberg, Abrams’ brilliance attracted first the attention, and then the lasting friendship of his Professor, Van Helmholz, a doctor, whose memory is also revered as one of the greatest physicists who ever lived. Abrams followed the advice and example of Van Helmholz in devoting his life to research, having as its object the correlation of the discoveries of science, to the functioning of the human body. Returning to his native San Francisco, Abrams was made Professor of Pathology, and later Director of Medical Studies at Stanford University, California. Most of his time, however, he devoted to original research associated with the mysteries of the Human Nervous System. Abrams’ most intimate medical friend in this country was the late Sir James Barr who described him as the greatest medical genius of our time. A verdict which, I do not doubt, history will confirm. Abrams died almost suddenly of Pneumonia in 1924. But Sir James Barr’s opinion, it would be more true to say that he was “hounded to death by his professional brethren”. If you were to take a piece of some such elemental material as iron, or sulphur (an element by the way, is a substitute w r you started to cut up, your final subdivision would be an atom of iron, or of sulphur — wouldn’t it? It would seem that nothing could be more obvious than that! Nobody ever doubted it until the early years of this present century when one of Nature’s most closely guarded secrets was wrested from her. I have no time to tell you what made certain great men of science begin to wonder if an atom — any and every atom — might be something totally different from what they had hitherto imagined it to be, nor can I tell you with what persistence and ingenuity the world’s Masters of Science pursued their investigation. All I can tell you is, that between the years 1906 and 1914 the nearly unbelievable discovery was made that ALL atoms, ALL atoms, consist in their last possible analysis of positively, and negatively charged electrical particles, and of nothing else. Since every material object, from a diamond to a potato, from a cancerous tumour to a mince pie, from a cabbage to a King, and the crown he wears, subdivides into atoms, there is no way of escaping the fact, that every material object that we can see, hear, feel, touch, smell or weigh is an electrical phenomenon — AND THIS MEANS YOU. Matter is electricity, YOU ARE MATTER — and that’s that. Although every atom is made of exactly the same “stuff”, electrical stuff, scientists know exactly how to distinguish between one kind of atom and another; because they have discovered that each elemental atom (let me remind you that an element is a substance composed of atoms of exactly the same kind, there are in all, about 92 elements) each elemental atom possesses characteristics which make it different from any other elemental atom. Iron is an element, so is sulphur, so is gold, so is mercury. In what way do they differ from each other? Well, the iron atom consists of 26 positively charged electrical particles, and 26 negatively charged electrical particles. The sulphur atom consists of only 16 particles of each kind. The gold atom possesses seventy-nine positive particles, electrically balanced by seventy-nine negative particles, and the mercury atom, just one more of each kind. It was the dream of the mediaeval alchemists to transmute the atoms of certain base metals into gold atoms. They failed, but during recent years some elemental atoms have been artificially transmuted into other elemental atoms, though not I think on a commercial scale. There is more to tell you about an atom than that is consists of particles of electricity: no man has ever seen or ever will see an atom — they are far too small, yet thanks to the experiments and mathematical calculations of the physicists, it is quite possible for you and me to envisage an atom, mentally. element — iron will do as an example. It consists invariably of 26 positively charged electrical particles now spoken as Protons, and 26 negatively charged particles now known as electrons. The 26 protons, clumped together in an inseparable mass form the central nucleus or atomic “Sun”, the 26 electrons are not clumped together, far from it, singly and individually, like the planets of the solar system, each electron ceaselessly whirls round and round the nucleus, not in any haphazard way, but each one in one or other of a limited number of possible orbital tracks. Unlike the planets of the solar system, in certain circumstances an electron can jump from one orbital path into another. I can tell you two other startling facts about these electrons; each one whirls round and round with a speed beyond human imagination, many thousands of miles in a second, and each electron is relatively (repeat relatively) as far from the atomic nucleus, and from its neighbouring electrons, as the planets of the solar system are from the sun of the solar system, and from each other. Between our earth and the sun, 98 million miles away, there is — apart from a thin envelope or thin air immediately surrounding us — NOTHING. Between an electron and the atomic nucleus, there is also NOTHING, “nothing” being another name for the ether of space, a still unsolved mystery, for though it is certainly non-material, it can nevertheless be thrown into ripples of vibrations by energy radiated from the sun and the most distant stars, ripples or waves which we call light, or heat according to their character. The ether of space appears to have no beginning and no ending; some people deny its existence altogether, though Sir Oliver Lodge and Einstein did not. Some people regard it as the medium through which thought vibrations can be telepathically transmitted. Some people believe that it links — and even act as a means of communication between, our material universe and other less substantial, but equally real, and may be much pleasanter realms. Now, even though fewer than a hundred different kinds of atoms exists — some extremely rare — they yet suffice to supply this earth with all the innumerable goods that it needs — from the Atlantic ocean, to Sir Winston Churchill, or a tablet of aspirin. This is because some elemental atoms have a way of combining with other elemental atoms, and when this happens, an entirely new substance comes into existence. For instance, two atoms of the has Hydrogen are always delighted to take into partnership with one atom of the gas Oxygen: the instant result being the formation of the wet stuff chemists call “H2O”, and you and I call water. can no longer regard its ultimate particle as AN atom. Atoms in combination with each other, are called “molecules”, a word meaning “little masses” (of atoms). The atoms which form our tissues are always chemically combined with other atoms to form molecules. They may be fairly simple structures, or very complex indeed, some molecules may consists of hundred of linked atoms. The ingredients forming perhaps the bulk of our human molecules are Hydrogen atoms, Oxygen atoms, Nitrogen atoms, Carbon atoms, Sodium atoms, with an added sprinkling of iron, Phosphorus and Calcium atoms, rather loosely linked together. These molecules are for the most part enclosed in tiny envelopes known as cells, which, small as they are, can easily be seen with the aid of a microscope. Billions of molecules are needed to fill even one cell, millions of cells form the substance of our bones, our muscles, our organs, our skins, our bodies. Now, while the fact remains fresh in your minds that atoms, whether in their elemental or their combined — that is to say, their molecular form, are vibrant structures, far more vibrant than the propellers of an aeroplane in flight, let me quote a few words which came from the pen of that great physicist, Sir Oliver Lodge when he was writing on the nature and properties of atoms and molecules. May I repeat that last sentence? mankind, are primarily due to as yet obscure electrical deviations from the normal in the structure of the molecules which in their billions form the substance of our cells, which in their turn, form the substance of our bodies. Now, if you are prepared to admit that the sound waves transmitted through the air from bells having a different structure from each other, will have a different character . . . . you will also be prepared to admit that electronic waves transmitted through the ether from vibrant molecules having a different structure from each other, will also have a different character. Abrams — feeling quite sure that the vibrant electrons forming a cancerous molecule must be differently numbered and differently arranged from those forming a tubercular — or any other pathological molecule, was equally sure that the waves or radiations they respectively send out, would also be different and characteristic. There would be the cancer wave, the tubercule wave, the malarial wave, the streptococcal wave — and if you like, the sulphur wave, and the quinine wave too. No physician had ever thought THAT thought before. Let me repeat it. Well, it is one thing to suspect — even to the point of certainty, the real existence of all kinds of pathological waves . . . But it is quite another thing to find a way of detecting them, and of identifying them too! Since the medical Profession has hitherto remained aloof, and unconcerned in regard to the new aspect, the electronic aspect of the molecules which collectively form healthy (or perhaps diseased) human tissues — Abrams knew that he could expect neither help, nor even intelligent interest from his colleagues during these early days of his research work. 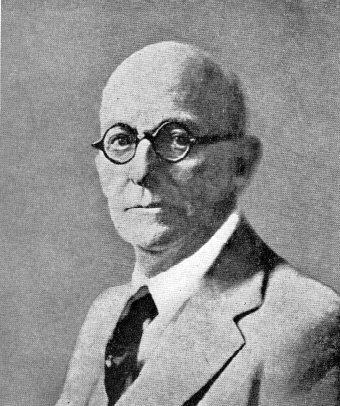 He did, however, gain the sympathetic understanding of certain radio experts, notably a Mr. Samuel Hoffman, who had achieved fame, by devising a then unique method for the detection of still distant Zeppelins approaching the U.S.A. coast. Hoffman and his colleagues thought it might be just possible to design a radio receiving set of such supersensitivity as to be capable of responding in some appreciable way to the various pathological radiations that Abrams so anxiously hoped to detect and identify. Mr. Hoffman was willing to “have a go”. Money being no object, Abrams engaged the services of this gentleman and his colleagues, built and equipped a laboratory for their use, and awaited results! Months passed, but alas, there were no results, which perhaps was not surprising, for in those distant days, “Wireless” was in its infancy: amplifying valves had not been invented, broadcasting had not begun . . . If a really great Radio Expert failed in his efforts to detect molecular radiations — could Abrams hope to succeed? ping, someone without warning switched on a X-Ray apparatus which stood a yard or two away. At that very instant the hitherto resonant percussion note dulled, and now sounded as dead as the note you would expect to hear if you tapped a lump of putty, instead of a gas filled abdomen! What in the world had happened? Abrams — who always thrilled to anything strange and unexpected, insisted on repeating the experiment over and over again, even making the man being percussed, stand facing North, East, South and West, while the X-Ray set was switched on and off. Most puzzling and mysterious to relate, this strange dulling of the percussion note when the X-Ray bulb was glowing, only occurred while the individual being percussed faced East, or West. If he faced North or South, the note elicited by percussion remained continuously — resonant. On some other occasion, Abrams was forcibly reminded of the episode I have just related when he was overhauling a new patient — a man — suffering from a cancerous ulcer of the lip (epithelioma). Merely in the course of his routine examination, Abrams percussed that same area of the patient’s abdominal wall, immediately above the navel. The patient was standing — facing as it happened West, but no X-Ray bulb had been switched on, nevertheless the note elicited by percussion was strangely flat, dull, dead. Abrams asked the patient to change his stance and face North: the percussion was repeated, but now the dull, dead sounding note had become hollow sounding, resonant, NORMAL. I need not tell that Abrams continued these manoeuvres until he was satisfied beyond all doubt that there could be no possibility of error in regard to the validity of the phenomenon he had just observed. Somewhat to the surprise of his class of Post Graduate students, Abrams got up from his chair, excused himself from further attendance at the Clinic that day, and walked quietly out of the room — apparently lost in thought. It is quite certain that he could have offered some theoretical explanation for both the observations I have related, but he did not choose to divulge his thoughts at that time: — neither shall I ! Although I did not personally know Abrams during those very early days of his work, I think it is safe to assume that he followed up the observation he had made in connection with the man with a cancerous lip, by collecting other patients suffering from cancer in any part of the body, and percussing their epigastric regions while they stood facing North, South, East or West. Always he found in these cancer patients, that the percussion note sounded dull while they faced West, but resonant — the exact opposite of dull — if they turned to face either North or South. The same phenomenon was also apparent over an area immediately to the inner border of the left shoulder blade — in patients suffering from cancer. This phenomenon was not detectable at all in the case of healthy people, nor is it easily detectable by a physician who is not skilled in the difficult art of percussion. One day Abrams notified his class of Post Graduate students, that on the following morning he was proposing to carry out a series of original experiments which, he believed, would be deeply interesting, and might also — if successful — prove to be of great practical, and scientific importance. He referred to the disappointing results of Mr. Hoffman’s efforts to design a wireless receiving set of sufficient sensitivity to detect the very feeble radiations emitted by pathological material, but expressed his belief that he had now succeeded in procuring a detecting device which — in skilled hands — would prove to be one-hundred per cent satisfactory. This instrument would, for the first time, be used for the detection and identification of molecular radiations of a pathological nature, at 10 a.m. on the following morning. Such an invitation could on no account be missed. The class assembled, to find Abrams seated at his desk, beside which stood a glass-topped table on which were an array of pathological specimens, or rather — of fragments snipped off pathological specimens — each of which had been carefully authenticated as genuine, by the director of the pathological department. All the specimens had been wrapped in tinfoil, and duly labelled. Seated in a chair beside Abrams was a healthy looking youth of perhaps 22 years of age, well known to everybody present as an odd job man; he helped in the garden, and did the washing up, in addition to running errands, etc. There was no sign of the mysterious apparatus that Abrams was so sure would prove so vastly superior to anything that poor Mr. Hoffman had been able to design. Perhaps it would be brought into the room later ! Abrams addressed his class. He had not, he said, devoted the best years of his life almost exclusively to research relating to the human nervous system, without becoming daily more and more impressed with the amazing manner in which it would react to incredibly feeble stimuli. He quoted many examples — the contraction of the pupil, for instance, to the faintest beam of light. He dwelt for a moment also on his observation that nerve fibres in the epigastric region would react to the stimulus of X-Rays generated in an apparatus some distance away, with the result that a group of muscle fibres, motivated by the stimulated nerve-fibres would contract, and by their contraction completely change the character of the note elicited by percussion. “When I notified,” continued Abrams, “that that same group of muscle fibres appeared to be in a state of permanent contraction in the case of any patient suffering from cancer in any part of the body, the thought was forced upon me that this strange, but none the less real, muscular contraction was a reflex phenomenon, due to radiant energy rippling, in the one case from an X-Ray bulb, in the other, from the vibrant molecules collectively forming the cancerous growth”. Abrams declared that his radiation theory was — if anything — supported by his further observation that the contracted muscle fibres at once relaxed if the individual under observation turned to face either North or South. In this case, Abrams suggested, his body would be brought into line with the very powerful electro magnetic forces passing through the earth from South to North. Might it not be the case that these forces would deflect, or even neutralise the far feebler radiations which bring the phenomena we have been discussing into existence. However — concluded Abrams, so long as we can make absolutely sure of our facts, other people can decide which theory best accounts for them. “And now” said Abrams, “it may surprise some of you to hear that the apparatus with which I am about to carry out some by no means unimportant experiments, is none other than the nerve-muscle mechanism which is an integral part of the body of our friend here, Ivor, my faithful house boy, who on countless occasions has obliged me by acting as guinea pig while I carried out experiments associated with my Neurological research work on him ! Let me repeat. There is nothing in the world so sensitive, so responsive to stimuli, however feeble they may appear to be, as the living nerve fibres of a healthy young man or woman. Ivor has kindly assured me that he has no objection to being the Subject of today’s experiments. For the purpose of this demonstration we must forget that Ivor is a man, and regard him merely as a super-sensitive wave detecting device. Abrams then asked the boy to strip to the waist, and stand — facing West, while the clear, ringing resonant note was being elicited by percussion over the area just above his navel. Will everybody please take note of the hollow, resonant quality of that note?” “Very well” said Abrams, “and now will one of you gentlemen step forward and take hold of this pair of forceps to which I have affixed one of these cancer specimens. While I steadily and continuously percuss this area of Ivor’s abdomen, will you, Dr. Robinson, place that specimen in light contact with his forehead. Keep it there some four or five seconds, remove it for a few moments, replace it again — and so on. The result of this experiment was exactly as Abrams hoped, and I have perhaps led you to expect. The instant the specimen was placed in actual contact with the boy’s forehead, certain muscle fibres contracted, altering the pitch of the note elicited by percussion so completely that no one present could fail to hear the difference. abnormally dull when percussed, but only so long as this (tubercular) specimen was held in contact with the subject’s forehead. When removed, the dull sounding note gave place to the normal resonant sounding note. During the days, weeks and perhaps months which followed, Abrams devoted the whole of his time to the laborious task of confirming the above phenomena. Hundreds of known cancer specimens had to be tested, hundreds of tubercular specimens had to be tested, before he would finally pass either the cancer reaction, or the tubercle reaction, as valid. It was in no hasty spirit that he began at last to draw up a series of charts, depicting the areas on which these “reactions” as he named them, might be detected — by careful and skilful, percussion. The streptococcal reaction — here: And so on. These early experiments — conducted as they were with operating theatre or post mortem room specimens, may not at first sight seem of much practical value to the workaday physician, but for all their — very temporary — crudity, they had already proved this hitherto undreamed of fact — which eventually the Medical Profession will inevitably accept, namely, that from the body (yes, and as Abrams subsequently showed, from every drop of blood in the body, of a sick man), signals denoting the nature of his disease are continuously being broadcast, and they are detectable, perhaps even from the moment that the disease begins. Abrams — once Professor of Pathology (the science appertaining to disease tissue cells) at a great University, was the first medical man — to proclaim his belief that the time-honoured tradition that disease is of cellular origin is out of date, and must be discarded. So long as the molecular constituents — the only constituents of a cell, remain normal in regard to the number and arrangement of the electrons and protons they contain, there can be no cellular disease. It is not until the molecular constituents — the only constituents, of a cell undergo some structural alteration, i.e. some change in the number and arrangement of their planetary electrons, that the cell itself begins to wilt and slowly develop characteristics which at long last become visible through the microscope of the cellular pathologist. Surely, it is impossible to imagine that the electronic architecture of any one of the molecules forming a cancerous cell is identical with any one of those forming either a normal cell, or of a pathological cell of another kind! The differing character of the Reactions of Abrams denote electronic differences between differing pathological entities, but of what exact nature are the forces which change a normal molecule, into a pathological molecule? have even considered the matter, and few — if any — of the latter are competent to blaze the trail towards the vast unknown territory which some day will be entered and explored by the Molecular Pathologist. Research — as envisaged by Abrams, carried out by competent atomic or molecular physicist, might solve many as yet unsolved problems associated with the origin of disease. Forces might be discovered which are available even now — if we only knew it — not only for correcting intra molecular aberrations, but even for preventing their occurrence. The time will inevitably come when every physician will know how to detect, and how, successfully to treat sick molecules, and thus arrest disease before pathology in the orthodox, cellular sense of the word, has even begun. Some of us sincerely believe that this is possible — even now ! In my efforts to describe Abrams’ discoveries clearly, and even, to the best of my ability — briefly, I have made no reference to the numerous minor problems which so frequently confronted him. The time has now however arrived when mention must be made of a problem of truly gigantic proportions which had to be solved, if Abrams’ lofty ambition of presenting the Medical Profession with a new, additional method of medical and surgical diagnosis was ever to be realised. Still making use of carefully chosen and attested post mortem room and operating-theatre pathological specimens, Abrams found that despite the obvious electronic differences which must surely exist between, for instance, cancerous molecules and those derived from syphilitic tissues, or between syphilitic and sarcomatous molecules, the reaction induced — detectable by percussion — was in each instance — identical ! Malarial material induced a very definite reaction two inches below and two inches to the left of the “subject’s” navel. But so also did a specimen consisting of a few grains of quinine ! The tubercle reaction was duplicated by the reaction induced by material infected by a somewhat rare disease caused by a fungus known as “Actinomycosis”. The reaction induced by streptococcal pus from an abscess was identical with that induced by a pinch of the element sulphur and so on. A cancerous specimen was detectable, so also was a syphilitic specimen, or a sarcomatous specimen, but the problem of DIFFERENTIATING one form of disease from another — that seemed to many of Abrams’ friends insoluble. They underestimated both Abrams’ persistence, and Abrams’ genius. now for a reason which will quickly become apparent he wished to find out if the radiations from his specimens would pass through a six-foot length of flex wire. A metal disc — two inches in diameter and furnished with a wooden handle — was soldered to each end of the wire, the subject being told to place the disc he was holding in contact with his forehead: some bystander was to be ready to hold the other, the distal, disc immediately above a pathological specimen which would be placed, alone, on the glass-topped table. Abrams made ready to percuss, and was pleased to find that the interposition of six feet wire between the specimens and the “subject” in no way affected the definiteness of the induced reactions. The problem of differential diagnosis of course remained. Abrams’ class of physicians however received a little thrill of excitement when Abrams pointed out that it made no real difference if the experimental pathological specimen was placed on the glass-topped table, or was contained within the body of a living man ! He enquired if any member of the class had reason to suspect a focus of disease in either of his organs, whereupon one of the students volunteered the information that a year previously he had received sanatorium treatment for early pulmonary tuberculosis, and would be most interested to learn if — by means of the tubercle reaction, Abrams could detect the exact site of the infection. Abrams willingly consented. The doctor-patient took his place alongside the ‘subject’, who held the disc at his end of the wire against his forehead, Abrams sat ready to percuss that area of the “subject’s” abdominal wall, just below the navel, an assistant grasping the handle attached to the distal disc would at a word from Abrams, place the distal disc over every part of the patient’s chest — while the members of the class, tense with excitement, awaited the tell-tale change in the percussion note which would (or should!) occur when the disc, picking up the tubercular radiations, reached and was held over the affected spot — and the ringing, resonant percussion note did change to a dull dead note at the moment when the distal disc was placed over — as it happened — the extreme apex of the patient’s right lung. “Check up on that” said Abrams, “see if I can tell when you remove the disc and replace it over that same area”. He could tell, and so could everyone in the room, by the dulling of the note elicited by percussion. The doctor-patient spoke: “You were dead right Dr. Abrams — every time: the trouble is in the apex of my right lung, nowhere else, as your reaction showed.” “Well of course,” commented Abrams, “what else did you expect: haven’t you seen me do the same experiment a dozen times, but making use of a specimen placed on this table instead of in your chest.” Abrams’ temper was never very sweet when he was worrying over such a problem as obsessed him now — the problem of differential diagnosis. remarkable diagnostic achievements. I gladly seize this opportunity of publicly stating the truth. I have already told you that for the purpose of detecting the infinitely feeble radiations emitted by pathological, chemical and medicinal material, Abrams was completely satisfied with the reflexes made apparent by percussion the human subject. These reflexes, or “reactions”, he knew beyond all doubt to be both valid and reliable, a fact first publicly ridiculed, but subsequently experimentally tested, confirmed, and ESTABLISHED by the late Lord Horder and his Committee of Investigation. But the urgent problem of differentiating — between two or more apparently identical reactions remained, until — after months of experimental research, it was solved by Abrams who found a suitably calibrated instrument known to generations of electrical engineers as a rheostat, would perfectly meet all his diagnostic requirements, since it would function not only as a rheostat, but, in regard to the feeble waves already referred to, as what is known as a Variable Inductance. Thousands of physicians, originally members of Abrams’ Post Graduate Classes, possess this instrument which they call the Abrams “Reflexophone” — an adaptation, only, by Abrams, for his special requirements, of an instrument used (though for quite another purpose) by electricians everywhere. The firm of Messrs. John Bell and Croyden have kindly provided me with a technical description of the Reflexophone as used by Abrams himself, and his followers, to this day. There is no more “Magic” or mystery in the Reflexophone than there is in a wireless set, a photographic camera, or a telescope; each is the product of knowledge, tireless industry — research — and — “vision”. So much then for the discreditable “Magic Box” myth! In the manner of its functioning at any rate, it appears to be the equivalent of the device with which every Wireless set is furnished, and with which nowadays we are all familiar. Turn the knob of your set until the needle on the illuminated dial points to the spot marked “Home Service” and — if that Station is, as they say, “on the air”, you will feel sure of two things, firstly, you will know beyond all doubt that the programme which you are now hearing is the programme being radiated from the Home Service Transmitter of the B.B.C. ; and secondly, that in the act of tuning in to receive that programme, you have automatically tuned out all other stations, and can enjoy your Bach or Brahms, without the slightest fear of being serenaded by an unwanted crooner broadcasting from other Station. Abrams now divided his six-foot length of flex into two, one of the cut ends he screwed into the “input” terminal of his “Reflexophone”; the other cut end he screwed into the output terminal of that instrument, this latter length of flex terminated in the disc held by the ‘subject’ in contact with his forehead; the other disc that I have sometimes referred to as the “distal” disc could be held above any specimen being experimented with. by Abrams’ instructions set the indicator pointing nowhere in particular: the ‘subject’ held his disc in contact with his forehead, an assistant held the distal disc over the cancer specimen, Abrams steadily percussed the area immediately above the subject’s navel. The note elicited by percussion was resonant. Abrams told “the man in charge of the knobs” to keep the indicator on the move until he said “stop”. Very shortly after this order had been given, the note elicited by percussion dulled. Abrams asked the position of the indicator, and was told it pointed to a spot on the dial marked “50”. By Abrams’ order, the cancer specimen was then removed and replaced by a syphilictic specimen; the indicator dial was deliberately left pointing at “50”. The note elicited by percussion remained, resonant. Again Abrams told “the man in charge of the knobs” to keep the indicator on the move until he said “stop”. This time, the percussion note lost its resonance and dulled when the indicator pointed to a spot on the dial marked “55”. Once more the specimen was changed, and a specimen of sacromatous tissue was substituted. Abrams ordered the indicator to be set at the spot on the dial marked “50”. The note elicited by percussion remained resonant. Abrams ordered the indicator to be set at the spot marked “55”. The note elicited by his percussion remained resonant. Yet again Abrams told “the man in charge of the knobs” to keep the indicator steadily moving until he said ‘stop’. This time the percussion note dulled when the indicator pointed to a spot marked “58”. A specimen picked up at random was then tested: on this occasion the percussion note changed from a resonant to a dull sounding note only when the indicator pointed at the spot on the dial marked “55”: Abrams diagnosed Syphilis. And he was right. Had the percussion note dulled while the indicator pointed at the spot on the dial marked “50”, Abrams would have diagnosed Cancer: and he would have been right again, just as he would have been right in his diagnosis of Sarcoma, had the indicator pointed to a spot on the dial marked “58”. Attested specimen representing every kind of pathological condition that the San Fransisco Pathological Department could find, were sent to, and tested by, Abrams — first, in order that he might find and chart the exact position on the body of the “subject” on which the reactions they respectifely induced would occur; and next, to determine and record the various positions at which the indicator of the Reflexophone must be set in order to “pick up”, or “tune into” their respective radiations: thus, “50” carcinoma: “55” syphilis: “58” sarcoma: “42” tuberculosis: “60” streptococcal toxins: “32” malarial toxins: “9” pneumococcal toxins — and so on. any rate in principle. Future improvements were to be hoped for. In an address delivered before the Royal Society of Medicine in January, 1925, Lord Horder referred to the Abrams’ Reflexophone. He announced that an X-Ray photograph of this apparatus had been taken, and it had been reported to him that it was, in point of fact, “a complete fake”. Later in this same address, Lord Horder referred to the Reflexophone as “a gadget, which so far as he could understand, might very well be replaced by a coal scuttle, or a pair of tongs”. In the issue of the British Journal of September 3rd, 1955, Lord Horder’s most misleading reference to the Reflexophone of Abrams’ as “a complete fake”, was repeated. The present writer immediately sent his own Reflexophone, as standardised by Abrams, to the famous firm of Electro Medical Instrument Manufactures, Messrs. John Bell and Croyden, with a request that the instrument should be subjected to every possible electrical test. Messrs. John Bell and Croyden. 0-50 in steps of 10 Ohms. 0-10 in steps of 1 Ohm. 0-25 in steps of 1/25th Ohm. These values are necessarily approximate, owing to certain variances on the stud contacts. This panel could well be used in conjunction with an inductive circuit. The rheostats are wound in such a manner as to be inductive, and therefore variations in resistance will also cause variation in inductance. It is possible that the function of this inductance is to pick up certain frequencies that Dr. Abrams found served his special purpose. This Report was immediately sent to the Editor of the British Medical Journal with a request that it should, in fairness, be published. This request was repeated three times, but on each occasion the request was rejected. During the years that Abrams was patiently establishing the basic principles underlying the new, and even fantastic method of diagnosis he was gradually perfecting, he preferred to experiment only with pathological specimens the nature of which was precisely known to him. 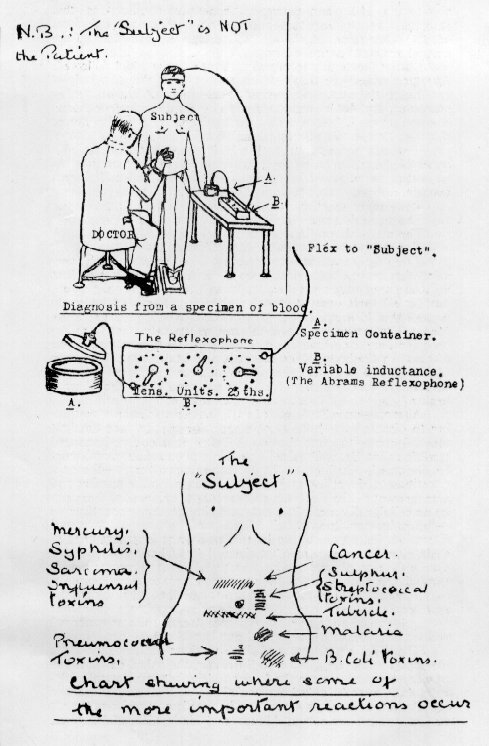 The next step was to determine experimentally, if blood specimens taken from patients obviously suffering from clearly defined forms of disease, such as cancer, tuberculosis, diphtheria, abscess formation, and so on would suffice to induce the same unmistakable reflexes or “reactions” on the body of the human wave detector as did pathological specimens representing these same forms of disease. In this respect, Abrams’ hopes were not disappointed. What must have surprised — if not Abrams himself — but surely his class of Post-Graduate students, was the fact that even less than a single drop of blood received on to a slip of white blotting paper was amply sufficient, with the aid of the Reflexophone, to render detectable perhaps several different injections — such as tuberculosis, streptococcal toxins, malarial poisons in the same patient. A container for the blood specimen, which latter Abrams insisted should be “earthed”, had to be designed. It was made of solid vulcanite, so shallow, that the blood specimen resting on two “earthed” pieces of aluminium was no more than a quarter of an inch below the condenser lid — which represents and replaces the “distal” disc, which in earlier days was held just above Abrams’ pathological specimens. A short length of wire from the lid of this specimen-container leads the radiating energy from the blood specimen to the input terminal of the Reflexophone. And now — for example, supposing pulmonary tuberculosis to be suspected, the dial of the Reflexophone would be set at “42”, for at that setting tubercular radiations will pass through the Reflexophone to the forehead of the human “subject”, or wave detector, on whose body the radiations would register as a muscular contraction in the area just below the latter’s navel, slight, but amply sufficient to alter the note elicited by skilled percussion, from a resonant to a dull sound. striking than his admission that an infinitesimal amount, a less than visible amount, of the element sulphur would, apparently infallibly, induce the “sulphur” reaction, detectable by percussion on the body of the human ‘subject’. In a series of no less than twenty-five trial tests for the “Presence”, or the “Absence” of sulphur in the specimens presented, not one single error was recorded, despite the almost astronomical odds against “accidental” success on the part of the percussor, or operator — odds computed and published by Lord Horder as being One to Thirty-Three million, five hundred and fifty-four thousand, four hundred and thirty-two ! The intelligent reader will understand that Abrams’ test were devised primarily for the early and accurate detection of disease, and he may consider that Lord Horder’s time would have been more usefully employed in investigating the infallibility of Abrams’ tests for human maladies, rather than the relatively unimportant tests for chemical infinitesimally. However: — “We decided to leave temporarily on one side” — wrote Lord Horder — “all question of the manner of degree in which the reactions of Abrams (if any) might be correlated with disease” . . . But, why? Abrams’ next very essential task was to devise some means of determining from the tiny blood specimens taken from patients, how far the latter’s diseases might be said to have advanced. He achieved this by means of a second Reflexophone through which energy, already picked up by the inductance effect of the first Reflexophone, would have to pass on its journey to the human subject. The reader will remember Messrs. Bell and Croyden’s description of the Reflexophone, as being comprised of three stud-controlled rheostats having scales so marked as to indicate. from 0 to 50, in steps of 10 Units. from 0 to 10, in steps of 1 Unit. from 0 to 25, in steps of 1/25th of a Unit. Abrams obtained a one-drop specimen of blood from a patient in a very advanced stage of tuberculosis: another from a patient in a midway stage of tuberculosis: a third from a patient in a very early stage of tuberculosis. The first Reflexophone was set at “42” (for the moment all three dials of the second Reflexophone were left at 0). The blood of the patient in an advanced stage was then placed in the container, and the dull sounding note indicative of tubercular disease, elicited by percussion in the ordinary way (and incidentally, precisely as Lord Horder witnessed the dull sounding note, indicative, on that occasion, of sulphur being elicited). The dial (0-50 Units) was then advanced one stud (equalling 10 Units) another stud (equalling 20 Units), a third stud (equalling 30 Units), a fourth stud — but no, on reaching the fourth stud, the dull note had given place to a resonant note: it appeared that the radiations from the blood specimen were blocked by the 40 Units of resistance placed between them and the “subject”: they could no longer reach him. cussion note was to be heard again. Leaving the “0-50 in steps of 10 Units”, dial on “30”, the “0-10 in steps of one unit” dial was brought into action, steady percussion proceeding the while, 31, 32, 33, 34, 35, 36, 37, 38 — stop, at this point, maybe, a resonant percussion note is heard again: one Unit is removed — the dull sound reappears, and that figure may be taken to indicate the stage reached in this advanced case of tubercular disease. The radiations from the blood of a patient in a midway stage of tuberculosis might be blocked by interposing some 12-14 Units of resistance between the blood specimen and the ‘subject’. Those of a patient in a very early, possible even a prepathological condition, might be blocked by the interposition of even less than 1 Unit of resistance, perhaps no more than 12/25ths of a Unit as measured on the “0-25 in steps of 1/25th Unit” — dial. One learns from the collective experience of oneself and one’s colleagues, the number of Units which may be regarded as indicating a high, a medium or a low reading in the case of any given disease. Although it must be frankly admitted that Abrams’ ideas, like those of any pioneer and original thinker were new and therefore unorthodox, it is difficult to understand why they should evoke the derisive smiles they so often do evoke, though generally from those who know nothing of the true facts, or insist on associating Abrams’ name with some purely mythical “Box”. Unable to discover any instrument made by human hands which was sufficiently sensitive to register atomic or molecular radiations, is there anything inherently foolish in the fact that he adapted to his needs the nerve-muscle mechanism of a healthy young man, which, from the point of view of sensitivity, far exceeds any device that human ingenuity can achieve. Is there anything inherently foolish in Abrams’ acceptance — nearly forty years ago, of the now universally recognised fact, that the atoms and molecules forming the human body, and all forms of matter, are electrical phenomena, and therefore subject to electrical laws? Need Abrams be adversely criticised for believing that different entities are sending out different radiations, or for his attempt, his entirely successful attempt, to detect and identify these radiations, very much in the manner that we are all accustomed to detect and identify the waves broadcast from innumerable British and Continental Broadcasting Stations. Thirty years ago, Lord Horder laughed at the so-called Electronic Reactions of Abrams, but twenty-five years ago, after what he described as a “merely preliminary” investigation, he was compelled by the sheer weight of experimental evidence, not only to admit the validity of the reactions as they occur on the human ‘subject’, but even, officially, to declare the phenomena “established, to a very high degree of probability”. “Neither fury of tongue, nor truculence of pen” — wrote Abrams in 1920 — “can discredit my observations, which are capable of analysis and demonstration”. His observations have assuredly been suppressed, but they cannot be discredited. gation carried out by Lord Horder and his Committee in 1924, the Reflexophone of Abrams was replaced by an instrument of a somewhat different design, the so-called Emanometer of Dr. W. Boyd of Glasgow. “To Abrams is due the important discovery that the attachment of apparatus (namely the Reflexophone) can modify the human reactions, and render them selective in nature”. (Extract from the Presidential Address to the Scottish Branch of the British Homeopathic Society, by W. Boyd, M.A., M.D.). One of Abrams’ discoveries, a highly important one too, might well be regarded as fantastic if only because, so far as I am aware, no theory has yet been advanced that can satisfactorily explain it. It has to do with localising tests, which in some way, possibly by change, Abrams hit upon. Let us take, as an example, the case of a woman who has developed a hard mass in one breast or the other — which, is not known. A spot of her blood has been obtained, placed in the specimen container: the dial of the Reflexophone has been set at “50”, a setting which by inductance picks up the cancer wave. The diagnostician, anyone familiar with the technique and a skilful percussor, takes his place before the ‘subject’ and proceeds steadily to percuss the area immediately above the subject’s navel. The note elicited by percussion is dull — therefore the cancer diagnosis is not in doubt. Remember, the patient is not in the room, and we are assuming that the diagnostician knows nothing whatever about her. We are challenging him to tell us if the cancerous mass is in the patient’s right, or the patient’s left breast. Steadily and continuously percussion, taking all possible care not to vary the character of his percussion stroke, he, the diagnostician, tells the subject to point with his finger tips first to his own right breast, and then to his left breast. It may be while he is pointing to his right breast, or while he is pointing to his left breast, but positively while he is pointing to one or the other, the dull sound elicited by percussion gives place to a normal, resonant sound (though only while the subject continues to point). It is precisely at the spot pointed at, that the woman owner of the blood spot carries her tumour! By precisely the same method, one can determine the exact site of — for example — tubercular or any focus; its exact position in the lung, in the bowel, in the bladder, or in one or other of the vertebrae, etc. health-destroying products, or toxins formed by innumerable micro-organisms such as the streptococcus, the staphylococcus, the pnenumococcus, etc., which though not detectable by means of a bacteriological microscope, are frequently the obscure, and even the unsuspecting cause of lasting ill-health, both functional and organic. From my personal knowledge of the man, I can declare that Abrams was prepared to sacrifice everything he possessed in order to achieve earlier and more accurate methods of diagnosis than had hitherto been available, but, if the best use was to be made of new methods of diagnosis, they must surely be followed up by new methods of treatment. I believe inspiration came to him in the following manner: One day Abrams was demonstrating the reaction induced by blood taken from a malarial patient (this reaction occurs over a small area two inches below, and two inches to the left of the subject’s navel. Abrams turned to his class. “Well”, he said, “there are upwards of forty of you physicians present, and probably all of you would prescribe quinine to a patient suffering from malaria, but can anyone of you offer any scientific reason for doing so — something better than the merely commonplace fact that its effects is nearly always beneficial”. There was no reply. Abrams thereupon sent for a few grains of Sulphate of Quinine, and having removed the malarial blood from the specimen container, he put the Quinine in its place. His next step was to percuss every part of the “subject’s” abdominal wall in a search to locate the position of the area over which the percussion note would be rendered abnormally dull by reason of the reaction induced by Quinine. That area was found two inches below, and two inches to the left of the “subject’s” navel: it was, in fact, identical with the area over which the malarial reaction occurs! As always, this observation was checked and rechecked by removing and replacing the Quinine specimen, over and over again. Few of those privileged to be present are likely to forget the significance of the next experiment, for all its simplicity. Abrams replaced the malarial material in the specimen container, placing on top of it a grain or two of Quinine wrapped in tissue paper. Abrams again attempted to elicit the malarial, or complementaryly, the quinine reaction. But the dull sound indicative of a reaction had given place to a resonant sound. Abrams expressed no surprise: he put forward the suggestion that the radiations sent forth by the vibrant electrons forming the quinine molecule exactly cancelled those sent forth by the electrons forming the malarial molecule. It was not by any operation of change that quinine had a curative effect on malaria, more probably it was a manifestation of some hitherto unsuspected electrical law which should become the subject of intensive research. For the next several months Abrams followed up the idea suggested by the “Quinine versus Malaria” experiment. as does syphilitic material, a reaction just above the “subject’s” navel, but when mercury and syphilitic material are tested simultaneously, the reaction induced by the one appears to be cancelled by that induced by the other. The dulling of the percussion note simply does not occur unless one or the other specimens are withdrawn from the specimen container. Many physicians, notably Dr. Boyd of Glasgow, whose name has already been mentioned as delivering the Presidential Address to the Scottish Branch of the British Homeopathic Society, now choose the remedies the prescribe for their patients by testing them against the reactions induced by the patient’s own blood. Never for a moment did Abrams doubt the real value of these “interference tests” as they are sometimes called, “Quinine versus Malaria”, “Mercury versus Syphilis”, etc., but yet another thought, still based on the electron theory of matter, and therefore on his molecular — as opposed to the cellular concept of disease, was filling his mind. His thoughts ran on these lines: “–the complete disappearance of both the malarial and the syphilis ‘reactions’ when quinine or mercury respectively are placed even in the vicinity of the specimens, can surely only be due to energy radiating from the vibrant electrons which form the quinine molecules, or the mercury atoms”. “Is it beyond the wit of man to devise a wave emitting instrument, a kind of wireless broadcasting station, which of necessity must be fitted with a device for altering the character of the the transmitted wave (ultimately to be delivered to the patient) in such a way that — as quinine does, it will cancel the reaction induced by malarial material: as mercury does, it will cancel the reaction induced by syphilitic material. When once the principle has been finally established, surely we need not despair of devising a wave emitting instrument which can be so adjusted as to cancel not only the malarial reaction, but the tubercle, the streptococcal, the staphylococcal, the pneumococcal, and other of the test reactions, possibly with the same beneficial effects that the malarial patient will almost certainly receive when he takes quinine, one of the very few ‘specific’ remedies we possess”. By profession, Abrams was, of course a physician, a neurologist, and although thanks to the example and influence of his Heidelberg friend, Professor Van Helmolz, he was at all times fully alive to the revolutionary discoveries which in those days were engrossing the minds of physicists the world over, he did not profess to be a technician. tunately gamboge is too poisonous to be given internally, though conceivably it might have a beneficial effect if administered in homeopathic doses. Mr. Hoffman quickly grasped Abrams’ mental conception of the proposed treatment instrument, and promised to do his utmost to overcome the many technical problems involved in its construction. It was not completed without many months of experimental work on the part of Mr. Hoffman and Abrams too, but at last they had reason to believe that the instrument had reached the stage in which it might be used for the treatment of a patient. Abrams happened to be interested at the time in a young man suffering from tuberculosis, a definite, but not unduly advanced case. He was sent for; a specimen of his blood taken — which, with the dial of the Reflexophone set at “42”, induced the characteristic reaction on the body of the healthy human ‘subject’, immediately below the latter’s navel. A four inch square metal plate attached to a wire from the new treatment instrument was then attached to the subject’s body. All was now ready. Abrams seated himself before the ‘subject’ and again demonstrated the dull percussion note indicative of the reaction. Mr. Hoffman switched on the new instrument, setting the wave tuning device at stud 1 (there are eleven studs altogether). There was no change in the dull percussion note. Stud 2; Stud 3; Stud 4, and still the note elicited by Abrams’ percussion remained — dull. Stud 5 —- A breath-taking moment, the dull note gave place to a resonant note, the tubercle reaction at any rate, had disappeared as completely as the malarial reaction disappears when a malarial specimen is tested simultaneously with quinine — or, as Dr. Abrams and Mr. Hoffman quickly discovered, when a malarial specimen is exposed to the wave radiating from the treatment instrument when the dial is set at Stud 1 ! I cannot pretend to know what effect treatment on Stud 5 of this instrument had on this — the first patient ever to be treated, but I can speak of the effects obtained on innumerable other patients suffering from the same and other forms of disease, and treated with the wave or waves so adjusted as to cancel the test reaction or reactions induced by his or her blood. The vast majority of the patients who received their daily hour for some four weeks while I was studying under Abrams improved immensely, and often spectacularly. Many of them I have kept in touch with, and many of them have been able to assure me that during the many years that have elapsed since they received Abrams’ treatment, the cloud which so long darkened their lives has never returned. There are just two points which I might refer to before I take my leave: (1) Never once have I referred to Atom bombs, or the fearful forces locked up within the atom, which physicists are trying to release safely. These forces are locked up within the nucleus of the atom and are only released when the atomic nucleus is rent asunder — hence the phrase, now becoming so familiar, “nuclear fission”. In the ordinary processes which are the concern of chemists and brochemists, the phenomena which occur have to do with the electrons encircling the atomic nuclei, rather than with the nuclei themselves. (2) Why not dispense with the “healthy human subject” and elicit the reactions on the body of the patient himself? Well, one can, provided that the patient is in fairly good shape. But too often the patient is old, nervous, enfeebled by illness, and — as a piece of apparatus (for that is what the subject actually is) obviously useless. Not only would it be a nerve-shattering ordeal, but an extremely exhausting one for the patient, if he or she was required to stand at attention while the doctor was steadily percussion the abdominal wall in search of possible cancer, syphilis, sarcoma or tubercle reactions. In taking my leave of you, I am reminded of the day when I took my leave of Abrams, a man I had respected from the first, and had grown truly to love. I thanked him not only for what he was doing for humanity in the teeth of the cruelist opposition, but for all he had done to widen my outlook. “My dear fellow”, he replied, “I claim nothing, expect to established a new principle. Thirty years of stiff research lies ahead, and I shall not live to accomplish much more”. (He died six months later.) “It is for those of you who have become familiar with my methods, to familiarise others: and for those of you with an aptitude for research, to carry on from the point at which I must leave off”. Thirty-three years have passed, I am now nearing old-age myself, and have few ambitions left, but one at least remains, and that is to proclaim what I know to be truth in regard to Abrams’ discoveries, and so far as in me lies, to ensure that his name shall live in the annals of Medicine, and receive the honour which few men indeed, have more justly earned. Reprinted, by permission of the Radionic Association of Great Britain, for Delawarr Laboratories, Oxford to perpetuate the early work of the late Dr. Albert Abrams.